Abstract: On the PCB you'll find a 7.1 channel audio codec, dual Gigabit NICs, an additional four channel Serial ATA controller and IEEE 1394a Firewire. 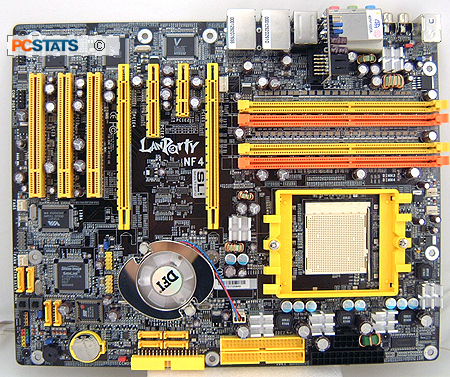 To many, the DFI LANParty NF4 SLI-DR was simply the best enthusiast motherboard ever designed. Sure it had a few quirks, but there are few if any motherboards in recent memory that come close to it in terms voltage and tweaking options. FutureMark's ORB is packed full of reasons why all the greatest overclockers are using this almost legendary Athlon64 motherboard! Since much of DFI's retail business comes from the enthusiast market, it makes sense for the company to listen to what consumers have to say. The original DFI LANParty NF4 SLI-DR was a huge success, but the company went back to the drawing board with feedback from consumers. Nine months later, out popped a brand new LANPartyUT NF4 SLI-DR Expert motherboard. Like the previous model, the DFI LANPartyUT NF4 SLI-DR Expert motherboard is based on the nvidia nForce4 SLI chipset. It supports all Socket 939 AMD Athlon64/FX/X2 processors on the market, and is geared for gaming performance. The four DIMM slots can be equipped with up to 4GB of the fastest dual channel DDR memory available, just as you might expect. 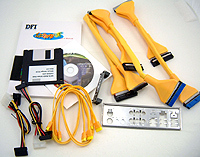 In terms of onboard goodies, DFI is known to throw in everything but the kitchen sink in with its boards, the LANPartyUT NF4 SLI-DR Expert is no exception. On the PCB you'll find a 7.1 channel audio codec, dual Gigabit NICs, an additional four channel Serial ATA controller and IEEE 1394a Firewire. If that's not enough for your needs, the DFI LANPartyUT NF4 SLI-DR Expert has two PCI Express x16 slots for dual SLI videocards, a PCI Express x4 and x1 slot for high bandwidth peripherals and three PCI slots for legacy devices. 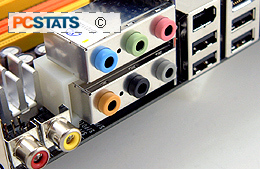 There are a total of eight SATA II headers, and two full channels for IDE devices. HyperTransport on the LANPartyUT NF4 SLI-DR Expert motherboard runs at a full 1 GHz, so bandwidth between the CPU and motherboard moves at a brisk 8 GB/s. Because of the memory controller's dual nature compatibility, when running two PC3200 DDR DIMMs in dual channel there is 6.4 GB/s available. The layout of the DFI LANPartyUT NF4 SLI-DR Expert is quite different from its predecessor. We'll get to the physical differences in a second, but the DFI motherboard is still a pleasure to install gear into. It's clear that the engineers at DFI are also hardware enthusiasts, because the layout of the motherboard is really well done. The audio ports still mount into the rear I/O area on a small daughterboard, so remember to push in the connector before installing the DFI LANPartyUT NF4 SLI-DR Expert into a case. Spotting the differences between the LANParty NF4 SLI-DR and LANPartyUT NF4 SLI-DR Expert is quite easy. First the CPU socket has moved from near the center of the PCB on the original LANParty NF4 SLI-DR towards the top right hand corner. The DIMM slots have moved from a horizontal position to sit vertically near the rear I/O. The DFI LANPartyUT NF4 SLI-DR Expert is one of the few Athlon64 motherboards that require a 24pin ATX power supply. Considering the motherboard's intended audience, this shouldn't be much of an issue, but is something to consider when upgrading. Also, users should note that the LANPartyUT NF4 SLI-DR Expert has an eight pin ATX 12V connector instead of the four-pin type we're all most familiar with. On the PCB level, DFI has upgraded the motherboard power supply from three phase to four phase. This along with the increased power supply specs mean hardware enthusiasts should not suffer the same voltage stability problems that sometimes affected the original DFI LANParty NF4 SLI-DR motherboard. 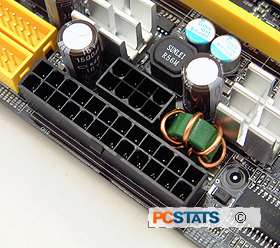 All power MOSFETs by the CPU socket are covered with passive aluminum heatsinks, and the nForce 4-SLI chipset is actively cooled.